Since we launched Luxury Hotelier magazine a year ago, many discussions have revolved around defining luxury. 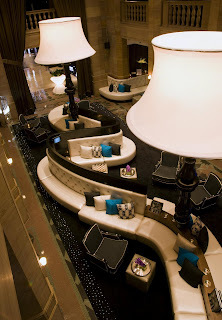 Lately, I have experienced what some in the hotel industry have called “the new luxury.” Fashion forward design, a tone of casual elegance and conversational, personalized service are some of the hallmarks of luxury hotels that are targeting guests who find more traditional luxury to be stuffy and scripted. It’s a more informal approach to luxury. At the other end of the spectrum are hotel owners who want their hotels rated six or even seven stars to cater to guests seeking lavish design and exclusivity. 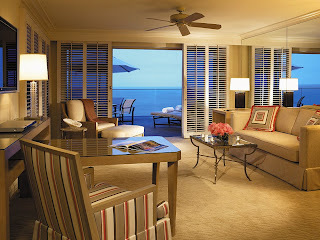 I just spent a lovely long weekend in California and visited the Surf & Sand Resort in Laguna Beach (suite pictured), where luxury means drinks by a fire ring at the outdoor lounge with stunning views of the sunset. Coastal cuisine is served at the aptly named Splashes restaurant, where waves break 25 feet below large windows that open wide to let in the sound of the Pacific. Service at the hotel is warm and relaxed: bellmen know the best place in town for fish tacos just as well as the concierge does. Last month, I had the pleasure of visiting the two W Hotels properties in Chicago: City Center (lobby—complete with lamps that make you feel like Alice in Wonderland—pictured below) and Lakeshore. The W brand is what I think of when people talk about new luxury. From the whimsical wording on the room service menu to the little touches in the Munchie Box (aka the minibar), such as the Survival Kit, (a boxed set of Diane Von Furstenburg mini lip glosses, mascara and perfume) and the Intimacy Kit (I’ll let you guess), W doesn’t take itself too seriously. That’s not to say anything is lacking in the hotel’s quality or pampering service. It’s more about the tone—playful, but still smart enough to know what guests want. I recently had the opportunity to interview Frits van Paasschen, president and chief executive officer of Starwood Hotels & Resorts for the past year, at the W New York, and he talked about how luxury has evolved. You can read more from the interview with van Paasschen in our September issue of Luxury Hotelier. But while we’re on the subject of the new CEO, one of the first things that struck me about van Paasschen—and I think this plays to the idea of the new luxury—is his approachability. Van Paasschen was eager to speak to the media in June during the NYU investment conference, and he was happy to share the company’s direction when I interviewed him for Luxury Hotelier and the Oct. 6 issue of Hotel & Motel Management. That might not sound particularly noteworthy, but I have covered Starwood for four years now, and this has not always been the case with the company’s top leaders. Van Paasschen is big on teamwork and has set out a vision for the company that he has been working hard to communicate to employees. His approachable nature will serve him well in this industry and at Starwood.